It’s been a great season folks. It’s been an honour and a privilege to be writing for you guys and what better way to round off the season than a roundup of the Grand Final between the Aston Aunties and the Cambridge Memers. Casters Dezachu and Tridd were quick to point out before the game that this match would be very much dependent on the junglers and how they would impact the lanes of their teams. J3T, considered by some the best jungler in the NUEL, was on Elise. He was up against lemmewinplz on Lee Sin, both picking champions with notable early pressure. This had the look of a potentially explosive start to the game. Despite lemmewinplz’s best attempts to tilt his team by forgetting to buy items at level 1, proceedings started off very calmly. Sure enough ganks came in at level three and four in the midlane, both midlaners losing their flashes in the process, but nothing else of significance was to be had. J3T’s invade on lemmewinplz’s red netted a summoner and a red buff shortly afterwards, but that was it for action until level six. 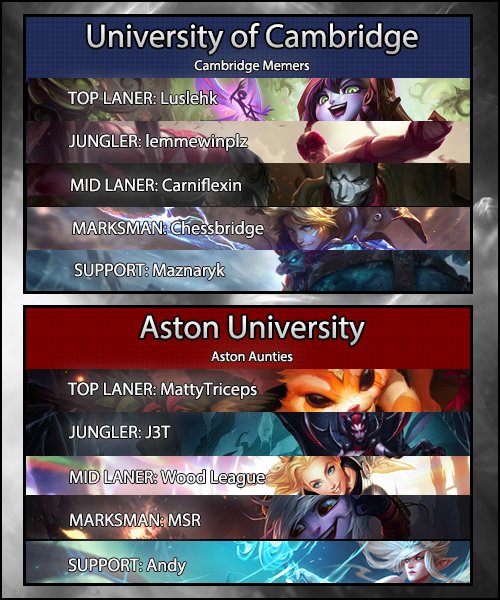 A Cambridge lead was opening up in the top lane for Luslehk’s Lulu with a fifteen cs difference, but this was countered by smaller leads in farm for Aston’s jungler and midlaner. Hitting the ten minute mark, no real advantages had been accrued. J3T’s Elise managed to secure the first Dragon for Aston with the help of his botlane but spotting this, Lemmewinplz was able to grab a kill for Luslehk’s Lulu by tower-diving MattyTriceps on Gnar. 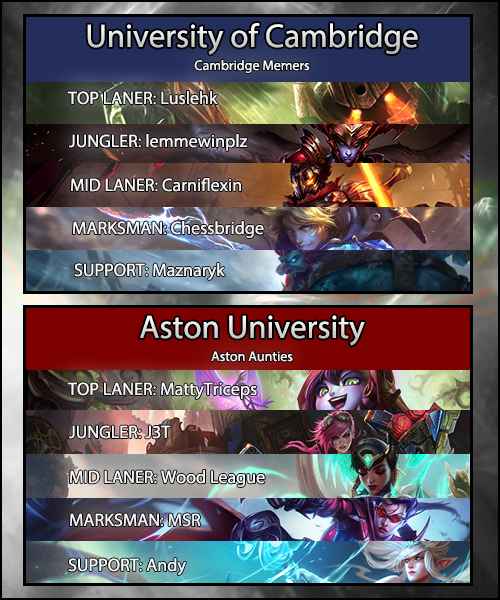 Cambridge’s more passive style in the botlane was yielding a small cs lead for Chessbridge and Maznaryk, but it was allowing Aston to chip away at their turret and generate some pressure on the map. This allowed for J3T to grab the Rift Herald buff. However, Lulu was able to push MattyTriceps out from under his tower shortly after, bringing the turret down and netting the first player controlled objective of the game. It seemed that Cambridge had been able to neuter the aggressive early game that J3T normally brings. J3T brought the Rift Herald buff to the bottom lane to try to finish off the botlane tower that had been so pressured by Aston’s laners. However, backup from the rest of the Cambridge Memers dissuaded them and they were forced to retreat. Lemmewinplz felt confident enough to get some deep wards in the enemy jungle. Yet the Blind Monk’s attempt to gain vision (oh the irony) was disrupted as he was ambushed by an airborne MSR and Wood League’s Lux. A binding and some point blank shooting later from the yordle netted a kill for J3T’s Elise. Cambridge seeing this looked to exploit their advantage in the top lane, sending the bottom lane to push at the inner turret of Aston and Luslehk’s Lulu to do minion clearing duty in the bottom lane. Lemmewinplz, back from his unfortunate foray, was able to set up a pick on the rotating Wood League who had been looking to help out the under siege MattyTriceps. This allowed Aston to secure their second Dragon of the game, but Cambridge did not quite have the minions or the damage to mount a significant threat to the inner turret, forcing them to back off. The Aston team looked to rotate mid to fill the hole left by Wood League, but this allowed Luslehk’s Lulu to pull down the bottom tower, furthering Cambridge’s lead which sat at 2k after eighteen minutes. Aston needed to make something happen to stem the gold flow of Cambridge. J3T decided to make an appearance in the top lane and with the help of MattyTriceps was able to bring down Luslehk for his second kill of the game. The tower went down shortly after, but this allowed Cambridge to put pressure on the mid turret. A small skirmish broke out between the two teams but Cambridge were forced to back out. Maznaryk’s Trundle just about made it out of the fight on very little health. Yet lo and behold, the Light of Demacia rained down upon him as the Lady of Luminosity smote him with a longrange Final Spark. Cambridge were sent into disarray and looked to back off in all directions. Another binding from Wood League was able to isolate Chessbridge on Ezreal and followup from the returning J3T meant he could not quite escape the Spider Queen’s clutches. What had previously been a promising looking push from Cambridge turned into a hastily organised rearguard action, Aston securing two towers in the midlane for their troubles. It was now them who had the 2k gold lead. Wood League’s emphasis on cooldown reduction in his build was starting to pay dividends as numerous bindings were catching out members of Cambridge, possibly a sign of things to come. With the Dragon coming back up, Cambridge were looking to find position around it. Aston went on the offensive and tried to push them off the pit, forcing Cambridge into a retreat. Again, a slightly disjointed rearguard action netted a kill for the Aunties as Luslehk ate a Cocoon from J3T and a Final Spark. Carniflexin was able to steal the Dragon for Cambridge, but lemmewinplz was caught on the way out of the pit having tried to steal it himself. This was a crucial Dragon that Cambridge had been able to secure, preventing Aston’s monopoly on them, but it came at a heavy price as the bottom inner turret went down under the attention of MSR. Aston seemed to be taking control of the game. Cambridge were struggling for direction were looking to regroup, but plans went out of the window after an incredibly sneaky Baron play from Aston, involving J3T, MattyTriceps and MSR hopping the wall to the pit to avoid detection. Another tower in the top lane would soon follow as they looked to push their advantage with empowered minions. A huge Cocoon from J3T stunned Chessbridge and started a chaotic teamfight which would turn into a tower dive as Cambridge kited back. Three members of Cambridge went down in succession, but the damage from the tower laser and Cambridge had taken its toll on Aston. MattyTriceps and Wood League were dropped by Carniflexin in the aftermath as he painted a bloody picture, the top lane floor his canvas. This bought the Memers some much needed respite. The Aunties came again on the back of a third Dragon and sieged the Memers’ middle inhibitor turret. It was actually catch from Carniflexin’s Jhin that started the fight as MSR was snared and brought low by the poke of Cambridge. However, as the yordle hopped to safety, Lemmewinplz wanted more as he went deep to try and make something happen. Carnage ensued, but it was Aston who were able to drop the Cambridge frontline first. Carniflexin did his best as he was able to clean up two kills for Cambridge, but was forced to retreat as the only Memer left. An inhibitor and Nexus turret lay in ruins as Aston left to regroup. Cambridge were able to pick up their third tower of the game as Aston retreated, but they were firmly on the backfoot. The call was made by the Memers to go for Baron. With the only AP threat on the team being Luslehk on Lulu and Aston stacking copious amounts of armour, they needed to find an answer fast. However, a teleport from MattyTriceps dissuaded them from taking the purple worm. A second attempt was made by Cambridge but the poke damage of Wood League again forced them back. Yet again, a rather disjointed retreat was their undoing as Carniflexin and Maznaryk were picked off and crushed by the Aunties. Aston went straight for the Nexus and despite the short lived attempts of Luslehk to peel them off, dying in the process, the game went to the team from the Midlands. Game one – Aston Aunties. The Aston Aunties had been tipped as the favourites for this clash and the first match had done little to dissuade those opinions. This would not dissuade the Cambridge Memers though as they headed onto the Rift with renewed vigour. However, they were up against J3T’s fabled Nidalee which had seen him earn his semi-final series’ mvp award. The Memers’ answer was a Shyvana for lemmewinplz, but the casters oozed praise for the kitty, the dragon lady only receiving some minor hype. In fact, lemmewinplz seemed to be having the early impact in the first few minutes of the game as he forced a flash off MattTriceps, back on his Gnar, at level two and another flash off J3T during a red side invade. However, lemmewinplz wanted that win a little too badly as he was collapsed on during an invade of his own, giving first blood to Wood League’s Orianna. This gave the go ahead for J3T to start making aggressive plays around the map, running to the top lane to force a flash out of Luslehk’s Sion who’s cs lead was starting to get somewhat away from MattyTriceps, and securing a kill onto Carniflexin in the midlane. With huge pressure being exerted by Ândy and MSR in the botlane resulting in a nine minute tower, things were not looking good for the Memers. Another four minutes and the bottom inner tower had fallen too. MattyTriceps was amassing a large lead in the top lane, but Cambridge remained with nothing to show for it. Cambridge knew they had to make something happen and tried to bring the lumbering form of Sion (complete with lumberjack skin to add that extra bit of lumber). The big man came crashing into Wood League and Lemmewinplz soared in, but Aston rallied around their midlaner before he could be chopped down and processed into the flat-pack furniture you find in IKEA. They fought off Cambridge, netting a kill and a tower. Further skirmishes broke out on the Rift soon after resulting in an exchange of towers and a kill for Wood League after a well aimed snare from MSR as Aston looked to push their advantage. It wouldn’t be until twenty-one minutes that the audience would have anything to get excited about. Cambridge were on the backfoot, but absorbing pressure well, farming up and holding out for their superior late game composition. However, the Aston Aunties were starting to resemble the Roald Dahl aunties from “James and the Giant Peach”, minus the Freudian undertones but with extra amounts of cruelty. They refused to let Cambridge sit quietly, putting huge pressure on their top inner tower. With spears, bullets and balls flying everywhere, there were only so many skillshots the Memers could dodge. A huge Command: Shockwave from Wood League brought three members of the Cambridge Memers low while MSR and J3T cleaned up. Lemmewinplz was able to pick up a consolation kill, but the headline was “Another tower down to the Aston Aunties”. The two teams went back to farming and shoving lanes in preparation for the next fight possibly at the next neutral objective. The Dragon appeared at twenty-four minutes which went uncontested to the Aston Aunties, their third of the game and the gold lead sitting at 6k gold. The vision wars started as the two teams snuck around Baron. However, neither team could find an opening. Instead Aston dictated the play towards the bottom side of the map and the Cambridge inhibitor turret, but the waveclear of Carniflexin on Lux put an end to any plans for sieging. The Baron wars started again, Aston seeing the buff as the only way past the ridiculous waveclear they were facing. They started smacking the purple worm in an attempt to bring it down, Cambridge in full knowledge of what was going on. However, out of the light of the sun came lemmewinplz on Shyvana, hurtling through the sky and smiting the Baron buff away with a huge, game-changing steal. Cambridge buoyed by the successful steal, charged at the perplexed Aston lineup dropping three of them. They walked away with two towers in the top lane, levelling the gold deficit. The game had been blown wide open. The momentum started swinging the way of the Memers as they became the ones to dictate the action. They were able to grab a tower in the midlane followed by a faintly contested Dragon, picking up their first of the game and pulling ahead of the Aunties ever so slightly. The fading of the Cambridge’s Baron buff was the signal for the Aunties to start looking for plays again. They focused their resources towards the top lane with the next Baron Nashor being key. They thought they found a pick onto lemmewinplz, but instead it was them who were in trouble, Aston members going a little too deep for the pick. Three members went down again for Aston and the second Baron buff was taken by the Memers. Towers in the midlane began to fall around the Aston Aunties as they frantically tried to regroup in their base. The Cambridge Memers were knocking them down while dishing out some hefty poke damage from Carniflexin and Chessbridge. Aston tried to mount a desperate defence of their inhibitor, seeing this as their last opportunity to defend meaningfully. However, with the huge forms of Luslehk and lemmewinplz zoning Aston, a hail of longrange skillshots from the backline and Maznaryk’s Janna positioned to thwart any potential dives, they could not get through. An ace in favour of Cambridge meant the Nexus was there for the taking. Game two – Cambridge Memers. What a contest. Aston were rattled by the loss and decided to mix things up in terms of strategy. MSR, captain, League of Legends player and all round top bloke decided that a “Protect Me” comp was the right direction to go in. The casters suggested that this was the kind of pressure he would thrive off or crumble to. The audience waited with baited breath to see whether he would lap up the attention or do his best cosplay of a popular pastry dish served hot with custard or cream. Personally I prefer cream. It just goes down so much smoother. While on paper Vi has better early gank potential it was lemmewinplz on Shyvana that had the immediate impact. A gank at level two onto MattyTriceps forced a flash and netted a kill for the fiery dragon lady. However, J3T responded in kind as a minute later Carniflexin’s Viktor was turned into a hand puppet with a Vi fist rammed places no fist should be (order your own hand puppet at justvithings.com or make your own on the Rift). This allowed for a return gank as Carniflexin tried to reestablish himself in lane which netted another kill for Aston, lemmewinplz unable to react. As the casters discussed MSR’s nighttime Vayne fantasies things turned quiet on the Rift. Aston were one kill and a bunch of farm up in the midlane but cs leads in the top lane and the bottom lane served to equalise the deficit. J3T felt it was time to take a sneaky Dragon, securing the first of the game in favour of Aston while Cambridge were keen on just farming. However, seeing the neutral objective lost, lemmewinplz headed over towards Rift Herald with Luslehk. They had brought the giant void crab low and things seemed to be going to plan, but J3T jumped in to push them off it. With the support of numerous shields from the incoming Wood League and MattyTriceps, Aston made short work of the two Cambridge members. Carniflexin again rushed to their aid, but again was pounded back to the fountain via a grey screen. Perplexingly the three members of Aston present decided not to take the Rift Herald, allowing lemmewinplz and Luslehk to return soon after and complete their task without hinderance. Chessbridge was able to to kill MSR in the bottom lane with the help of Maznaryk, but this run of play meant Aston had pulled ahead ever so slightly at twelve minutes. Carniflexin, the Cambridge MVP in the previous game despite a rather indifferent laning phase was not having the best time. His situation was further compounded as J3T returned to turn the vulnerable Viktor into a pair of gloves for her gloves. Gloveception completed, the kill was taken by the now worryingly fed Wood League on Karma. Seeing his Aston counterpart ruining their midlaner’s day, lemmewinplz tried to make something happen in the botlane. However, a well-timed teleport from MattyTriceps turned things around as MSR grabbed the kill onto the Shyvana. Cambridge turrets went down in the midlane and botlane, Aston having firmly established a lead. Ândy were able to aggress onto the Prodigal Explorer. With the help of J3T, Chessbridge was killed, Maznaryk falling shortly after. The two kills went to MSR, perfect for Aston, not so much for Cambridge. Lemmewinplz got caught in the toplane by Wood League, another kill for Aston. The snowball was definitely rolling. 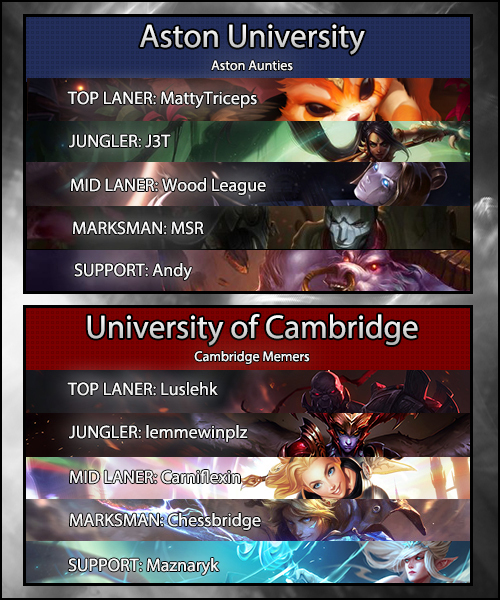 Cambridge were able to survive a fight in the top lane at twenty minutes and grab the inner tower in the midlane, but it was Aston who were dictating the play. Cambridge needed a pick to be able to gain anything meaningful and somehow it fell into their lap. MSR had been happily farming away in the bottom lane and was looking to join a potential teamfight in the midlane. However, lemmewinplz had the presence of mind to cut her off and solo killed her. Aston turned tail, realising that their main damage threat was not present, but Cambridge were able to pick up another kill, this time Ândy going down. The Memers looked to Baron Nashor to solve their problems, but the Aunties were keen on interrupting them. A flying J3T with the shields and extra speed afforded by Wood League and MattyTriceps dove right into the backline wreaking havoc. Cambridge tried their best to peel him off their carries, but Carniflexin was brought down while Carniflexin met a sad end at the hands of Aston’s utility mages. Twenty-six minutes in and Baron Nashor was being targeted again. This time Aston were fully grouped at full strength and felt confident enough to start the objective. Cambridge charged at the pit to interrupt them, but had second thoughts as a supercharged Aston team quickly turned towards them. A disorganised retreat meant lemmewinplz was left isolated. The Shyvana, normally so quick across the ground was no match for the Vayne as MSR used everything to secure the kill, the zoning of Wood League’s Karma keeping the rest of the Memers from helping out their jungler. The Aunties took the bottom inner tower for their troubles and returned to Baron. Cambridge tried their best to pull them off it. They succeeded in doing so, but with only Luslehk to dive the now unkillable MSR since lemmewinplz was still contemplating life in purgatory, the fight ended predictably. Aston took three kills, some turrets, an inhibitor, a Dragon and a sizeable amount of Cambridge ego. Aston were now sitting on a 6k gold lead and were well on their way to that fifth Dragon buff; it only seemed a matter of time before the Midlands team would pull out the victory. However, Cambridge defended admirably as Aston grew slightly overconfident. A ill-advised tower dive in the toplane meant Cambridge’s backline and tower laser could go to work on Aston’s lineup. All the shields and go faster stripes were piled onto J3T, but it was MattyTriceps who paid the price, buying Cambridge some respite, despite the loss of a tower. Yet a mighty comeback wasn’t to be as the Twitch chat and NUEL Live attendees could see what was coming. Aston returned to the now open inhibitor with no pesky laser to hold them off. One more ace and it was all over. Game three went to the Aunties, the 8-21 score indicative of a reasonably comfortable game. 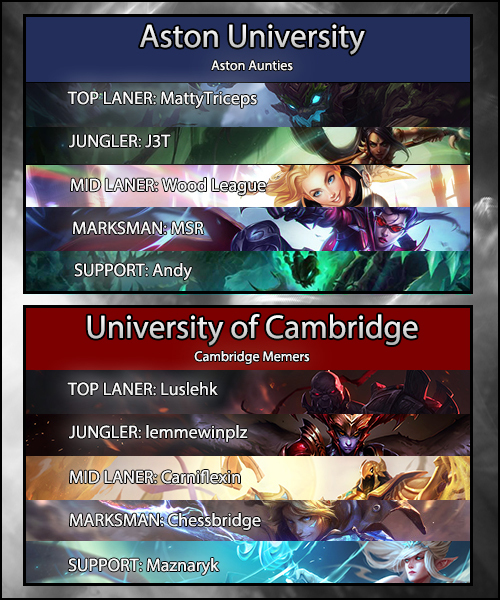 Cambridge needed to pull something out of the bag here, deciding to go for the Azir for Carniflexin and the rest of the team on the picks that brought success in the second game. Their composition boasted significant late game power with four of their champions needing items before they could get going. Arguably though with Janna and Ezreal kiting back and Sion and Shyvana diving forwards, the composition could be interpreted as slightly mismatched. Aston decided the time was right to bring out the Maokai for MattyTriceps, the casters convinced the Aston toplaner was still living in Patch 5.14. However, his solid teamfight presence had been working wonders for Aston and with J3T on his favoured Nidalee to pressure in the early stages they had a solid composition of their own. The first five minutes of the game were reasonably quiet for both teams, but innovative pathing from J3T allowed him to secure a three buff start, delaying lemmewinplz reaching his smite item. There was some trading on the top side of the map between MattyTricep’s Maokai and Luslehk, complete with Lumberjack Sion skin. But as six minutes came up on the board, a skirmish in the bottom lane brought jungler attention. Prolonged trading between the two botlanes saw lemmewinplz arriving to burn MSR’s flash. Cambridge had slightly overcommitted and J3T pounced in, lengthening the fight. Summoners were traded but when the dust settled, it was Ândy who had walked away with a kill, lemmewinplz lying prone inside a lane bush. J3T’s early aggression was paying real dividends for Aston as he capitalised on an aggressive trade by MattyTriceps. The magical tree had been somewhat under siege but had been managing to keep up in cs. He brought the offending lumberjack low, J3T pouncing in to execute Luslehk under tower. However, Luslehk was not impressed, deciding to use his ultimate down midlane. Charging straight into Wood League’s Lux at maximum velocity, the Lady of Luminosity stood very little chance as the undead lumberjack took some extra timber back to the top lane. Suddenly action was everywhere, a skirmish in the bottom lane bringing teleports from both teams and roams from the midlaners. Both teams were dropped low resulting in attempted ultimate snipes from Chessbridge and Wood League. In the end, it was Chessbridge who paid the price. The Memers were forced away resulting in a tower, a Dragon and a 1.8k gold lead for the Aunties. The Aston Aunties began committing resources to the bottom side of the map, but Cambridge were swift to answer. A rotation mid saw the Aunties trying to catch Carniflexin under tower, the swift use of cleanse keeping him from possible death. However, backup arrived in the huge form of Luslehk. A massive Unstoppable Onslaught stunned three members of Aston allowing the rest of the Memers to pile in, life bars disappearing in an instant. The gold lead swung back in the favour of Cambridge as a tower and Rift Herald were secured off the back of that fight. Cambridge joy soon turned slightly sour as two cheap kills were picked up by the Aunties as they were punished for a lack of vision on the bottom side of the map. They quickly regrouped following the respawn timers and headed to the top side of the map where they had set up much more extensive ward coverage. MattyTriceps sensed something was up and called for bdackup while running towards the safety of his second tier tower. Cambridge were able to chase him down, but all their resources had been spent killing the Aston tank leaving them with very few tools with which to fight the rest of their opponents. They made a hasty retreat, haemorrhaging teammates along the way as MSR secured a triple kill while Wood League ensured only one member the Cambridge team survived. The Memers were reluctant to fight now knowing that they were now somewhat handicapped by the Aston gold lead. The Aunties’ impeccable control of Dragon (which they had held throughout the series) meant they secured the second of the game with little contest. Cambridge sent lemmewinplz to help Luslehk knock down the first tier tower of MattyTriceps, but this only resulted in a kill for J3T as two other members came to back up the Aston top laner. Everything they tried to pull off seemed to blow up in their faces. By twenty minutes, Aston were ahead by 2.5k, Cambridge being forced to dance to their tune. They exchanged the Cambridge middle outer turret for the Aston top outer turret as lemmewinplz took to splitpushing to deny the pressure Aston were building. He managed to secure a second tower before recalling as Aston realised they’d miscalculated. However, it was still Aston who were directing proceedings. At twenty-five minutes, a third Dragon went to the Aunties, again uncontested, that fifth Dragon timer creeping ever closer. Cambridge had managed to equalise the gold deficit through sheer weight of cs, but they were not the ones in control. By twenty-seven minutes, the Memers were feeling confident enough to venture towards Baron. Luslehk noticed Ândy out of position and tried to start a fight with Unstoppable Onslaught. The Aston support was able to sidestep behind a wall, but the Cambridge support Maznaryk was blindsided by a binding from Wood League as he tried to offer assistance. This was the signal for Aston to flood forward, MSR going ham and flashing into the Cambridge team. By the end of the fight, three memers were down at no cost to the Aunties. Lemmwinplz was able to exchange the Baron for the Aston middle inner turret, but Cambridge had lost significant ground. They were about to lose a lot more as Aston took empowered minions to the bottom lane. Lemmewinplz was caught out in front of the inner tower as the Aston team dove forward. Cambridge tried to defend as the Aunties streamed into their base and were able to kill Wood League, but Aston were able to complete the ace comfortably, ending the game at thirty minutes. Game four and the series went to the Aston Aunties. An honourable mention has to go to Wood League for his contribution throughout the series with big games on Lux and Karma, in the latter topping the damage chart in a “Protect the MSR” composition by dealing 26k damage, 4k more than the main carry while providing huge utility to keep his team alive. However, the MVP for the series was J3T who put in consistently fantastic performances on whatever champion he played. Some say Aston live by the early game which make J3T the ever beating heart of the team. He ended the series with a 7.14KDA and was responsible for getting the Aston snowball rolling in every game, putting his team in the best position possible going into the midgame. His influence did not stop there whether he was landing huge spears with Nidalee, making picks with Elise or frontlining on Vi, a constant threat throughout to the Cambridge lineup in the mid and late game. Congratulations J3T, you’re our MVP for the series. Congratulations to the Aston Aunties on winning what has been an incredible tournament and thank you to everyone that’s been involved. We couldn’t have done it without you. The NUEL will be back with the Summer Tournament later in the year so stay tuned!